What's the 1-carat diamond price? How to calculate the diamond weight? If you are looking for the perfect diamonds for the engagement ring or marvelous earrings, check out this diamond weight calculator which can help you to assess the weight of this desirable gem. Choose between a dozen of different shapes - such as, e.g., heart-shaped diamonds or pear shaped diamonds - to find the one you need. Keep reading if you are wondering what a diamond carat weight is or you want to know more about diamond weight formulas. Also, we strongly believe that you will find this ring size converter useful. Carat is a unit of mass used for measuring gemstones and pearls. It took its name from carob tree seeds that were used for centuries as a standard of weighing the gemstones - although their mass is not unusually constant in comparison to other plants seeds. The carat unit was standardized more than a century ago, and it's now equal to 200 mg. Remember that the price of the diamonds is not increasing proportionally with its weight - a 3-karat diamond will cost more than three 1-carat diamonds. Have you heard about the famous Koh-i-Noor diamond, which is a part of the British Crown Jewels? It's one of the largest cut diamonds in the world, weighing 105.6 carats, and its value is estimated to more than 200 million dollars. That's definitely more than the price of a hundred of 1-carat diamonds or fifty of 2-carats, which are the popular choice for engagement ring diamonds. Diamonds come in many different shapes and sizes. The most popular form is the round diamond - this classic represents 3/4 of all diamonds sold. The other fancy-shaped diamonds are getting more and more popular recently, as they are usually less expensive than an equivalent round shaped diamond. Select the diamond shape. You can choose between twelve different shapes. Let's assume you want to check the weight of a pear-shaped diamond. Enter the diamond's dimensions. Type its length, width, and depth, or diameter and depth if you've chosen the round diamond. Take as an example the pear shape diamond 6 mm long, 4 mm wide with depth (height) equal to 3 mm. Check the ring girdle. If it's thin, you don't need to change anything, for thicker you may want to add a few percents. Assume that our exemplary diamond has a medium girdle, so let's type, e.g., 2%. Find out if the diamond shape is standard. Our pear-shaped diamond has wide wings, so we enter 5%. 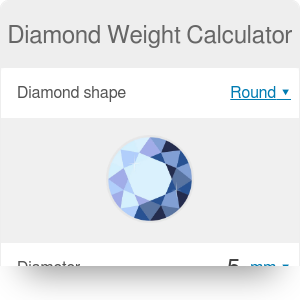 Diamond weight calculator displays the diamond weight in carats. It's 0.45 carats in our example. Now find out for yourself what's the weight in carats for the similar size of a heart-shaped diamond. If you want to be even more accurate in your diamond weight estimate, you can take into account two other factors influencing the final diamond weight: girdle thickness and shape correction factor. Type the value in the correction factor box of the diamond weight calculator, and it will take those conditions into account when calculating the final diamond weight. If the ratio of the chosen gem is not equal to the standard value from the table, the calculator uses the nearest given ratio. Diamond Weight Calculator can be embedded on your website to enrich the content you wrote and make it easier for your visitors to understand your message.